The eclim architecture is pretty straight forward. Commands issued by a user in vim are relayed via nailgun to the running eclim daemon and the proper command implementation is then located and executed. The commands which are executed on the eclimd side are also fairly simple. They accept an object containing the command line parameters passed into the eclim invocation and then return an object (String, Collection, etc) which is converted to a json response. 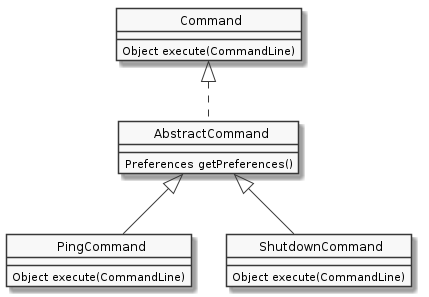 Below is a simple class diagram showing the hierarchy of a couple typical commands. Another important aspect of eclim’s architecture is support for plugins. Plugins for eclim are bundled as eclipse plugins with their auto start attribute set to false. When the eclim daemon starts it will locate and load any eclipse plugin with an ‘org.eclim.’ prefix. When a plugin is loaded, eclim will locate the plugin’s required resources provider and invoke its initialize method which will then inject its resources (messages, command options, etc) into eclim and register any new commands.